Savor Home: House of Fifty Blog Feature! Today is a very exciting day for me! On Wednesday, I received an e-mail from Janell Beals, the wonderfully talented editor of House of Fifty and author of Isabella & Max Rooms. She asked me if she could feature my recent post on clogs and my blog today on House of Fifty's blog. I promise I almost screamed in my cube at work! So I e-mailed her back and basically said, "Heck yeah!!" 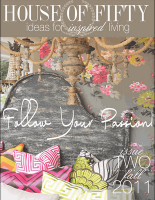 So if you would be so kind, please click here to check out Savor Home's feature!! Also, if you need some good reading material for the weekend, please check out the latest issue of House of Fifty. It's hot off the press and really good! Congrats on the feature! So very exciting! Janell is a goddess in blogland, and it's so awesome to be featured. Thanks for sharing. awww Congrats girl! I too would have screamed if I got an email from Janell!! Heading over to check it out now! Congratulations Tiffany! I'm gonna hop over and check out there most current issue now. Hi Tiffany! I actually found your blog while reading House of Fifty's blog. I am hooked - love your blog. You have yourself a brand new follower. Congrats on the feature. Oh my that is so wonderful! I'll be sure to check out your feature. However, there are aswell bags of betray plan at home jobs out there as well.